It is not often that a new work by an acclaimed playwright opens in a very small theater.Exits and Entrances not only debuted at the 78 seat Fountain Theater on the east side of Hollywood, it was expressly written for this venue.It is by Athol Fugard&#146;s own description, &#147;a small play,&#148; and is satisfying only if viewed in this light.He sees himself as being &#147;a miniaturist (who) writes on small canvases.&#148; A one act, written for two characters, and lasting less than 90 minutes including extensive excerpts from classic theater, Exits and Entrances is a vignette or a showcase, rather than a fully developed play. 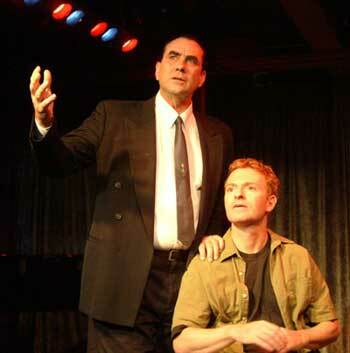 Autobiographical, by Fugard&#146;s own description, the characters are a never named young playwright (William Dennis Hurley) and the distinguished actor, Andre Huguenet (Morlan Higgins) whom he admires.The playwright had had a minor part in one of the actor&#146;s plays and had been the older man&#146;s assistant–in effect, manservant. Opening with the younger man recalling those days, making entries in his diary, and hearing church bells outside, the playwright makes the first of his beautifully phrased pronouncements, &#147;I am listening to the birth cries of the new South Africa,&#148; and comments about the Afrikaner actor Huguenet, &#147;Impeccable timing, (his) dying so it coincides with the birth of the republic.&#148; Huguenet burstsonto the stage and the prior relationship is reenacted. Higgins is a commanding presence both in size and power.He conjures up images of classically produced Shakespearean drama.Hurley is the charming young playwright who worships the actor, while tangling, charmingly, with Huguenet on the issues of Apartheid, and Huguenet&#146;s belief that South African theater should be Afrikaner theater.Huguenet is the blustering prima donna; the playwright, the worshiping but doubting apprentice. Fugard is now 72 years old and in Exits and Entrances he is recalling this relationship with the older man with fondness for his own youth and foreshadowings of his own old age and death.This is the playwright as thoughtful observer of his country&#146;s disastrous policies without the anger one would imagine would drive someone to write as Fugard has of the injustices of apartheid and the squalor he has witnessed.He says of his father, &#147;he is dying of unimportance,&#148; and acknowledges that through inattention, he himself has contributed to his father&#146;s decline. Huguenet, in speaking about an actor who had inspired him as a young man,refers to &#147;the calamity of a too long life.&#148;Fugard has said this play is autobiographical and it can be assumed his thoughts on mortality are, too. He is also using Exits and Entrances to muse on the nature of home and the experience of writing for the theater.One can be sure Fugard is stating his own self appraisal when Huguenet says of another playwright, &#147;paper is his real home,&#148; in contrast to himself: &#147;I am an actor.The theater is my real home.&#148;Fugard expresses his own discomfort when a play is being performed in front of reviewers who are scribbling madly in their notebooks and not feeling the drama before them. So what is missing? Exits and Entrances is tightly written and very quotable, skillfully acted and directed.Yet something is lacking. With all that finesse, audience emotion is not engaged.Huguenet&#146;s acting competence is established repeatedly with Hurley reciting complete passages from classic works such as the entire soliloquy from Hamlet. But the pain and loneliness of a closeted homosexual in an intolerant society, or a confirmed Afrikaner in a world that is passing him by, is not explored. Might it not be better to devote less stage time to the established genius of Shakespeare and more to the inner life of the characters?Was the young playwright always so charming and gracious?Could he be as enveloped in the politics of his country as he is and yet always present such a pleasant face?This is autobiography without revelation–well done and pleasant to watch, but it could have been so much more.